You can use the brilliant star Sirius – and the star Vega – to imagine the direction our sun and solar system are traveling through space. The sun in its orbit is traveling away from Sirus and toward the star Vega. Although we could not fit them both on one chart, Vega shines over your northwestern horizon, opposite Sirius, at nightfall at this time of year. If you stand outside in early evening with your back to Sirius – facing northwest – you will be facing the direction our solar system moves through the Milky Way galaxy. Cool, huh? Tonight’s chart shows you how to be sure you are seeing Sirius. It shows the east-southeastern sky not long after the sky gets dark, as viewed from mid-northern latitudes. The brightest star of nighttime – Sirius – shows up close to the horizon in early evening, rising upward as evening deepens into night. 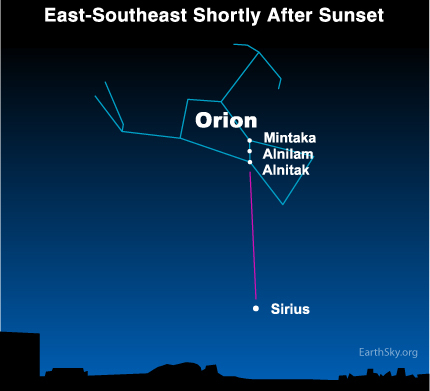 Sirius is found by drawing a line through the three stars of Orion’s Belt. When an overwhelmingly bright star like Sirius hovers near the horizon, it doesn’t just twinkle. It scintillates: sparkles in red and blue. Look for Sirius at nightfall tonight. It is easy to find because it is so bright. Then turn around so that your back is to this bright star. 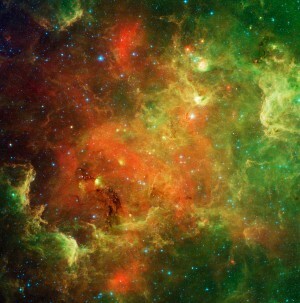 You will be facing into the sun’s path through the Milky Way! Site contents copyright © 2019 Recorder Online	except as noted. All rights reserved. | 88 queries in 2.107 seconds.